Compliments of the Season and please accept our hearty welcome to the NEC meeting of our great and unparalleled Association. We thank the Almighty for journey mercies particularly for those of you who travelled for this meeting from States of the Federation outside Abuja. It is the Season of goodwill and, on behalf of the National Officers, I sincerely extend our goodwill and Seasons' Greetings to all our members, represented at this NEC meeting by you, our distinguished NEC members. It is three months now since we were inaugurated and sworn in as your National Officers on 31 August 2018 and this is our first NEC meeting. This is also the NEC meeting for Quarter 2 of the NBA 2018/2019 Financial Year which, in practice, is calculated from August of each year to the July of the succeeding year. That, understandably, is why our Audited Financial Statement for each year is prepared as at July of that year. In effect, NBA's 2018/2019 Q1 spans the period August to October 2018 and Q2 of our Financial Year will span the period November 2018 to January 2019. Our Constitution stipulates that NEC meetings must be held quarterly and as in every structured institution, this can only be interpreted to mean every financial quarter. The NEC meeting that was held on 26 August 2018 therefore qualified as our 2018/2019 Q1 NEC meeting and the meeting of today, as I earlier pointed out, is our 2018/2019 Q2 NEC meeting. All properly organized institutions schedule their quarterly Board of Directors' meetings – the equivalent of our NEC – for such dates within the quarter as would allow for the preparation and publication of the preceding quarter's Financial Statements and this is understandable because, those quarterly meetings afford the directing minds of the institution the opportunity to take stock and reflect on the organization's performance in the preceding quarter for the purposes of mapping their next quarter activities and indeed the future activities of the enterprise or organization generally. Going forward, we would schedule our quarterly NEC meetings in like manner, making sure that our quarterly accounts are ready and circulated for dissection and discussions during those meetings. That, in large parts, informed the holding of this meeting in this month of December, thereby allowing a one- month period from the end of 2018/2019 Q1 for the preparation of our Management Accounts for the said Q1 which would be presented at this meeting and published to our members immediately after this NEC meeting, in fulfilment of our cornerstone commitment to enthrone transparency and financial rectitude in our body politic. 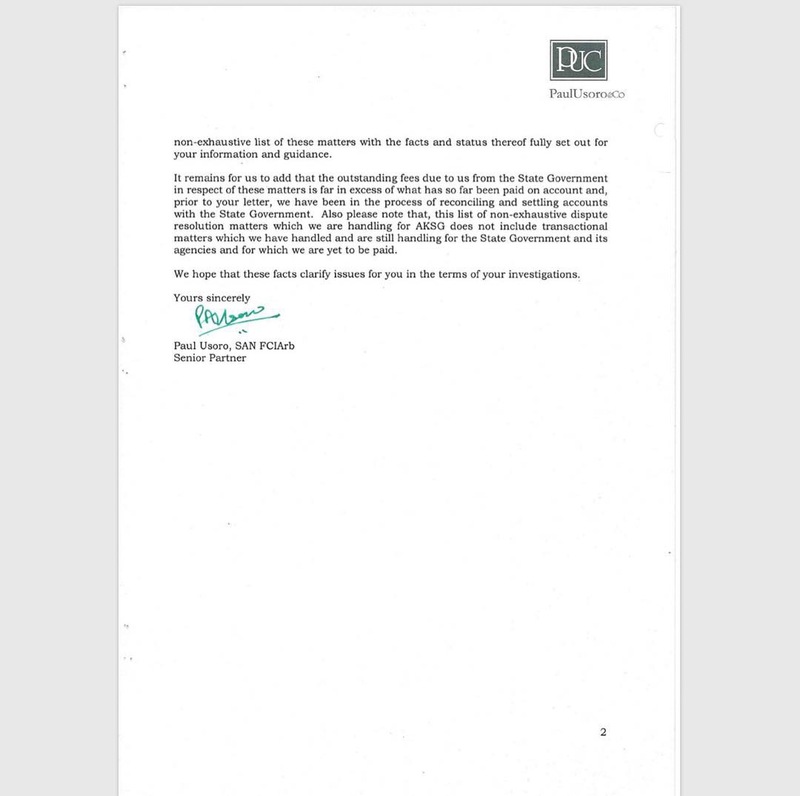 Just before reviewing our performance in 2018/2019 Q1, it is perhaps only right that I address the orchestrated social and online media reports of the last 24 hours in regard to my allegedly being charged to court for money laundering offences by the Economic and Financial Crimes Commission ("EFCC"). I have not been served with any such charge neither have I been arraigned before any court on any such charge or at all. It is however correct that I have been questioned by the EFCC in the last several months in respect of fees that my Firm had been paid by Akwa Ibom State Government ("AKSG") between 2015 and 2016 and also fees that Governor Udom Emmanuel, the Governorof Akwa Ibom State had paid to me for the benefit of Counsel that worked on his Election Petition Appeal that was decided by the Supreme Court early in 2016. 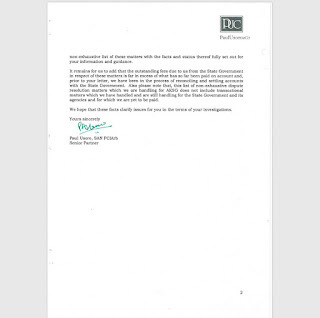 "I was invited by the EFCC Bank Fraud Section, vide a letter of 28 May 2018, to provide "clarification" in respect of "a case" that they were investigating. I met with them on Monday, Tuesday and Wednesday, 04, 05 and 06 June 2018 and their questioning of me was on two specific issues as outlined below. "I was questioned in respect of a N300m cash inflow that came into PUC's Zenith Bank Account on 14 March 2016 and the subsequent outflows from the account to various Senior Counsel between 22-23 March 2016. I explained that the inflow was payment by Governor Udom Emmanuel in respect of an Election Petition Appeal that was determined by the Supreme Court and that I served as the coordinating Counsel in respect of the matter and had engaged various Senior Counsel therefor on his behalf. The subsequent outflows which were made through bank transfers were the professional fees which I made on his behalf to those Counsel based on the N300m inflow. They wanted to know how the cash lodgment was made into the PUC account and I informed them that the lodgment was made at the instance of Governor Emmanuel (albeit, not necessarily by him) and definitely not by me or any PUC personnel and that I had no further information, clue or knowledge beyond that. "EFCC also wished to know the basis for the aggregate inflow of N1,110,000,000.00, paid in 4 tranches, into the PUC Access Bank Account from AKSG between 24 August 2015 and 18 September 2016. I provided an explanation in writing to them showing that these were payments-on-account by the State in respect of several dispute resolution matters that we were and, in some cases, are still handling for the State Government. I backed the explanation up with (a) copies of the PUC Notes of Charges in respect of 3 of the 4 payment tranches, pursuant to which the payments were made and which clearly showed that these were payments-on-account in respect of various matters that we were handling for the State; and (b) a non-exhaustive List of 19 matters, none of which was election-related, which we were handling for the State at all times material to their enquiry and the payments. We pointed out that we were in the process of reconciling accounts with the State Government in order to determine the outstanding fees due from the Government to us and that for none of these matters were we previously paid by the State Government. "They questioned me on the agreed fees for each of the matters and I told them that there was no such agreement which explains why the payments were made on account, albeit, there is a reconciliation process afoot. They asserted that from their experience, fees are always agreed in advance with counsel prior to engagement. I strenuously refuted that assertion and gave them illustrative instances where we've worked for FGN – the MTN Fine case, for instance – and fees were not agreed in advance and we haven't even been paid as I write. I also gave instances of very established organizations where we've experienced the same circumstances and concluded by informing them that the processes for engagement of counsel and negotiation/payments of their fees are not standard and immutable but remain the exclusive prerogative of the client and are at the clients' discretion. They asked for our letters of engagements and I explained that traditionally, letters of engagements are not issued to us by the State in these matters; the State merely hands over the processes to us and requests that we represent the State in the matters or institute required proceedings on behalf of the State.In any case, I told them that I wasn't aware that AKSG was complaining howsoever in respect of these fees or denying that we had provided the services outlined in our letter and even if they were, the court/arbitral records and processes in these proceedings are available to bear our services out. "Attention then turned to the payments that PUC made to some senior counsel at all times materials to the EFCC investigation. 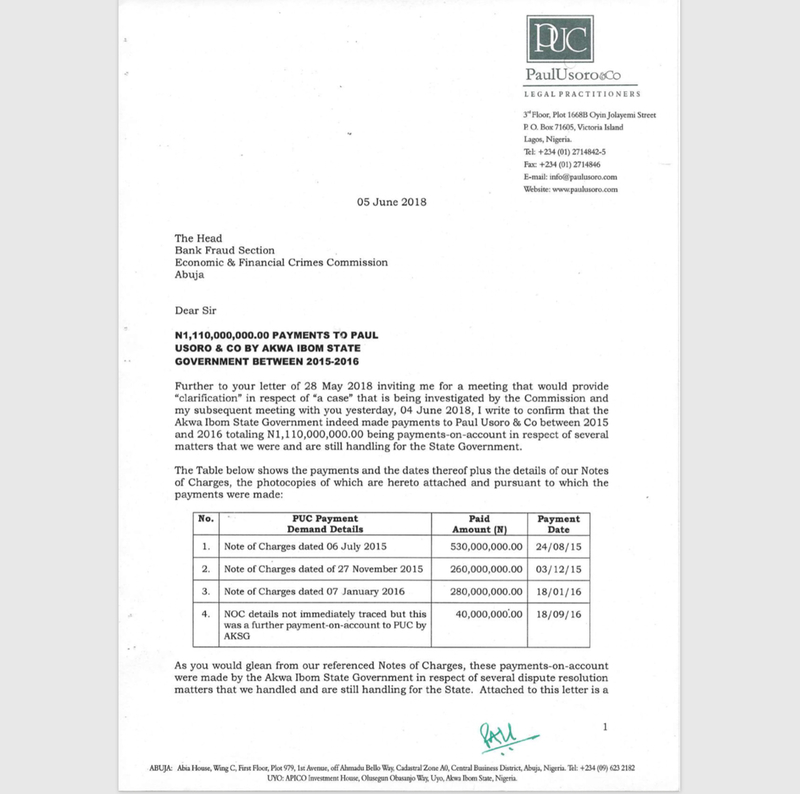 Soon after the payment-on-account of N530m by AKSG on 24 August 2015, we had made some payments to several senior counsel. Similar payments were also made soon after the payments to us by AKSG of N260m and N280m respectively on 03 December 2015 and 18 January 2016 and the EFCC wanted to know what these payments were made for. I explained that these were the same set of Counsel – comprising eminent members of the Inner Bar and a host of other members of the outer Bar – that I had engaged to work with me in respect of the Election Petition matter for which payments were made from the PUC Zenith Bank Account (for the Supreme Court Appeal) and that these payments that were made from the PUC Access Bank Account were professional fees which I paid to them for their services at the Tribunal and Court of Appeal. They wanted to know if I was paying them out of the AKSG payments-on-account and I answered in the negative. I explained that these were independent transactions and that the AKSG payments-on-account were in respect of my Firm's professional services to the State while the payments to the senior counsel were made by me for and on behalf of Governor Udom Emmanuel, at his request and in expectation of refunds at a future date. "The EFCC tried very hard to link the payments to the senior counsel to the AKSG payments-on- account to PUC but I told them that, at each time when the inflows from AKSG came into PUC's account, the Firm had available funds in its Access Bank account of not less than N450m (made up, amongst others, of a standing overdraft from Access Bank) and that the fresh funds always comingled with the existing available funds and it was practically impossible to separate them by source and attribute subsequent expenditures to specific preceding inflows or available funds. 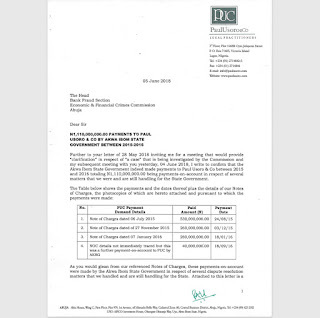 They wanted to know why these payments to senior counsel were made after each of the 3 inflows into the Firm's account and not prior and I explained that the Firm retained the unquestionable discretion as to when it pays its creditors and that, in any case, if the payments were made before the AKSG inflows, the same EFCC would've been questioning me as to whether those AKSG inflows were made to fill the hole in our account sequel to the senior counsel outflows. Such line of questioning, I stressed, was futile, speculative, tendentious, untenable, baseless, incorrect and unrewarding apart from being utterly unfair to me and PUC. I wondered aloud in my Statement why, if they thought a pattern was established of payments to senior counsel after each AKSG inflow, how come there was no such payment sequel to the N40,000,000.00 inflow from the State on 18 September 2016 and why I'm not questioned on this." For completeness, I have attached to this Address, my letter of 05 June 2018 to the EFCC in which I detailed the 19 arbitral and litigation matters that we had handled for AKSG at all times material to their investigation and the payments to my Firm. (a) Client-Lawyer Privilege. It has judicially and historically been acknowledged that issues of fees, as between a lawyer and his client, is a matter of privilege. The recent decision of the Court of Appeal that was delivered on 14 June 2017 in Appeal Number CA/A/202/2015: Central Bank of Nigeria v Registered Trustees of the Nigerian Bar Association & Attorney General of the Federation affirmed this position. By questioning lawyers on the legitimate fees that they have earned from clients, the EFCC is breaching the lawyer-client privilege and showing complete disregard for the judgments of the Courts in this regard. (e) Independence of Legal Profession and Practice. The practice of law, as we all know, is founded on the independence of the legal practitioner and his courage to advocate on behalf of his client to the best of his ability and conviction. That independence and thecourage of the advocate are now being threatened and trampled upon by the EFCC. Lawyers now have to work and walk on tip-toe, looking over their shoulders to determine whether the EFCC would be coming after them solely on account of their courage and independence in advocacy. That does not bode well for the profession or for legal practice generally. My case is not isolated; I have received incessant reports from lawyers who represent clients against the EFCC whose bank accounts and legitimate fees have been and are being investigated by the EFCC sequel to their representations of those clients – not any different from my case. Democracy and the rule of law are threatened when the lawyers' independence and courage in advocacy are fettered howsoever, whether by the EFCC or any other person or organization, consequent upon the lawyers' choice of clients. I will say no more, for now, on this matter. Turning to the review of our activities in 2018/2019 Q1, I should, perhaps start with the challenges we faced, as NBA, in the said Quarter. I can immediately isolate two of the most glaring challenges,the first being violent crimes and attacks on our members countrywide and the second being the extremely deleterious state of our finances. Chairman of our Auchi Branch, A AAtemoagbo also lost his wife when criminals rained bullet shots at his car, along Auchi-Benin Road, near Ehor, in Edo State, in an attempt to halt him. May we please observe a minute's silence in honour of these departed souls. Returning to the incident during which Joan Atemoagbo was violently killed, Mr. Atemoagbo's car was indeed stopped by the hoodlums and he was kidnapped and only released days later after the payment of the specified ransom amount. As we pointed out in our Statement of 01 December 2018, "these incidents bring to the fore the terrifying state of insecurity in our land. It is instructive that" these incidents "occurred in the three geographical regions of Nigeria – the East, West and North – clearly making the point that no part of the country is immune from the current nemesis of insecurity. These murders" and kidnap incidents "also epitomize the all-round insecurity of lives and property and incessant killings of innocent citizens by criminals in the country". I am certain that this state of affairs would constitute a significant discussion topic under our State of the Nation agenda item at this meeting. Our second challenge has been paucity of funds. As clearly stated in the NBA's Financial Statement as at 31 August 2018 which would be presented shortly, not only did we inherit an empty treasury, we inherited enormous liability of over N400,000,000.00 as at the said 31 August 2018 (and still counting). The said debt overhang did not only haunt and inhibit our 2018/2019 Q1 activities, it promises to castrate and affect our activities and plans for 2019;we would shortly make a Presentation to NEC members that would graphically showthe impact of that debt overhang on our projected revenue for 2019 and, by extension, our plans and activities for next year. I. Financial transparency and accountability. This was our cornerstone reform agenda and we fulfilled that promise through the preparation and publication of the Financial Statement as at 31 August 2018. We indeed committed to the preparation and publication of quarterly financial statements and the 2018/2019 Q1 FS will be presented at today's NEC meeting and published to all our members soon thereafter. In order to vest this enterprise with professionalism and credibility, we engaged PricewaterhouseCoopers ("PwC"), one of the biggest international accounting firms, to assist us in the preparation of the Financial Statements. They are with us today to present the Financial Statements. II. Financial Prudence. As the Q1 Financial Statement would clearly show, prudence in financial management has been our watchword. We are stringent in curtailing and avoiding wasteful and unnecessary spending. Some may argue that prudence is forced upon us by the exigencies of our financial paucity, but it needs be remembered that the debt overhang of over N400,000,000 was incurred at a time that our purse was empty, resulting in the non-payment of those liabilities by the previous administration. If we were so inclined, we could have racked up further credits and pile up further debts for succeeding NBA administrations. In fact, if we were so inclined, we would not even have started the policy of financial transparency and accountability which, more than anything else, forces prudence on the managers of our resources. The point that I make is that, financial prudence is practiced by us in the administration of the NBA affairs, as of choice and we are hoping to pass on this virtue to the succeeding NBA administrations through constitutional reforms. III. Regaining the Confidence of Members. We believe that the combination of the two successes afore-highlighted has rekindled the confidence of our members in the NBA which had waned considerably as at when we took over the mantle of NBA leadership. The fact that our members are now fully in the know of the state of NBA's finances and management, coupled with demonstrated and demonstrable prudence and openness in the management of our finances, we believe, has gone quite some length in restoring confidence in the Association and in its leadership. That confidence would continue to be boosted, we believe, with the consistency in our preparation and publication of quarterly accounts and demonstrated prudence in the management of our affairs and finances. IV. NBA Secretariat Reforms. The work attitude at the NBA Secretariat has changed drastically and for the better consequent upon the purposeful leadership by your National Officers. We are now working to retool and completely reform the NBA Secretariat workforce in order to achieve efficiency and instill discipline. The Finance Function Diagnostic Report, which would be presented shortly to NEC members by PwC, represents one of the significant initiatives that we have undertaken in our mission to institute corporate governance and efficiency in the running of the NBA at the National Secretariat. We must also state that the August arrears of salaries which our administration inherited has been cleared and we are now working to ensure that salaries are paid timeously each month and do not get stray into the succeeding months. That has also boosted the confidence of the Secretariat workforce and gives the National Officers the boost and leverage to demand more of them. National Elections in 2019 and not subvert the will of our people. Our said report earned for the NBA tremendous international and local accolades. Sequel to the publication of that report, we have had meetings and consultations with various international organizations and foreign countries on the possibilities of collaboration in the monitoring of the 2019 National Elections. These organizations and countries include the Special Representative of the United Nation's Secretary General, the European Union delegation, ECOWAS delegation and a number of other such high-profile embassies, delegations and agencies. We would continue to work with these embassies, organizations and bodies in enhancing the credibility of the NBA not only in election monitoring but in other possible areas of collaboration. VI. Proactive and pervasive communication and responsiveness to members' complaints. We consciously work at constant and pervasive communication with our members. We take it as our credo to always connect with our members countrywide. I have opened direct channels of communication with all the Chairmen of the different branches of our Association and I have indeed spoken with each of them directly and personally. More often than not, once we receive complaints from our members or branches, we call the member or branch directly to discuss their issues and/or complaints and assist in resolving them. Such direct and immediate interface, we have found, to be most useful in building trust and confidence with our members and also in resolving the challenges and issues that they face. after orders were placed. That, indeed, was a pervasive problem and issue and we have now resolved that issueas some Branch Chairmen would readily testify. We have, of course, not achieved our optimum; this is still a work-in-progress and we do hope to shorten further the delivery time as we move into 2019. I. Alternative Sources of Funding. If our Association must survive and thrive, we must urgently focus on finding additional and alternative sources of revenue for it. Currently, we survive mostly on a mono-source income, to wit, practice fees that are paid by our members. As I would shortly present, the funds from the payment of practice fees can hardly sustain the Association, especially, given the heavy debt overhang under which we labor. We are looking at additional streams of income that we can and will explore and exploit for the Association and would keep NEC duly updated and informed thereon. required constitutional reform, we recall that, in the wake of the last NBA elections, there was a clamor for electoral reforms. Those reforms would need to be coupled with the constitutional reforms and we believe that these reviews and reforms must necessarily be concludedand finally adopted by members at the next Annual General Meeting which would hold during our Annual General Conference in August 2019 – well ahead of the NBA elections in 2020. III. Clean Data Capture and Institutional Memory at the NBA Secretariat. We consider it a crying shame that, even as I write, the NBA cannot boast of a clean,comprehensive and publishedmembership data, not just for election purposes but for use in all circumstances including for the verification of our members. Such a clean and publishable data capture does not have to be aimed at the NBA election; indeed, for it to be credible, it must be delinked from our elections and constituted as an independent project capable of multi-use and functions. The benefits of such an enterprise cannot be over-emphasized and we do aim to work at it and achieve such a credible and published data capture before the Annual General Conference in August/September 2019.
of law. Several actions of governments and its agencies continue to threaten and undermine the rule of law in our country and these we must continually resist and fight against. We know that we have your mandate to continue that struggle and we therefore commit not to relent in the coming months or at all. V. Website Revamp and Young Lawyers Activities. Our members, from the feedback that we receive, are not happy with the state of our website. We indeed plan to completely revamp it early in 2019and, amongst others, make it interactive amongst our members. There are several features that we plan to introduce in the course of revamping the website and we are currently engaged in discussions with consultants thereon. Talking about website revamp brings to mind our commitment to devote special focus to and on our young lawyers – the future of our profession. Demographics clearly show that this is a major segment of our profession to whom we must pay and devote particular and special attention. Sadly, we could not do very much in that direction during Q1 because of our economic circumstances. We do plan to remedy this and to register considerable improvement in that area in the succeeding quarters of 2018/2019 and beyond. We cannot and do not intend to roll out all our blueprint for the succeeding months in this Welcome Address. The issues that we raise in this Address are merely illustrative of the areas we would focus on in the succeeding quarters of 2018/2019 and beyond and we would keep you, our dear NEC members, constantly informed and updated on the progress thereon. that fight knowing and understanding that a mischievous and mala fide attack on one of us is an attack on all of us and that is what the EFCC attack on me clearly exemplifies. As the President, I must also thank all my National Officers for the faith and trust they have in me and, more importantly, the support they have given and continue to give me. The successes we have achieved are joint successes and I merely lead from the front with your support and cooperation. I thank you all for the belief, hope and trust you repose in me and I assure you and indeed our members that I shall neither betray nor disappoint. Once again, I thank you all, my dear NEC Members for the privilege of serving you as the NBA President. Long live the Federal Republic of Nigeria. Long live the Nigerian Bar Association.